Whether you are looking for personal counseling or help for a distressed relationship, Safe Hands Counseling offers a gentle approach for those seeking lasting results. In a non-judgmental environment based on a foundation of acceptance and safety, we will get to the heart of the matter which is where true healing and life change happens. 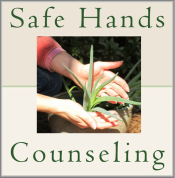 At Safe Hands Counseling the top priority is helping you meet your needs. We will create the relief you are looking for by working together to identify and resolve the underlying conflicts and patterns that are causing you discomfort. Using an approach based on brain research, I provide Individual Counseling, Marriage Therapy and Family Therapy. Call today ( 601-397-4273 ) and start the journey towards greater peace and joy for you and your loved ones! I want to do everything I can to help you feel comfortable and confident as you start the counseling process. The free consultation, done either in person or on the phone, gives a risk free opportunity to find out what counseling is like. See Facts & Details page for more information. The words in color are links to more information. Insurance: I am a network provider with Blue Cross Blue Sheild and Advanced Health Systems. Fees: between $30-120 per session depending on insurance and the availability of grants for need based rate reduction. Location: Near the Primos on Lake Harbour in Ridgeland Mississippi 39157. About Caelin: I am a Licensed Professional Counselor, 40 years old and have been working with clients since 2006. Please Note: After the birth of my son in July, I decided to limit my practice to part time. I am not sure when I will start accepting new clients again. What is Counseling with Caelin like? I smile a lot and like to laugh. I am gentle and focus on building you up... (more). Caelin's Approach with Individuals: See the Personal Counseling Page. Caelin's Approach for Marriage, Couples and Families: See the Relationship Counseling Page.